Allelopathic Potential of Robinia pseudo-acacia L.
Robinia pseudo-acacia L. (black locust) is a nonindigenous species currently invading the central part of Japanese grasslands. Several allelochemicals were identified and characterized from the leaf tissue. The growth of both radicle and hypocotyl in the tested species (barnyard grass, white clover, lettuce, and Chinese cabbage) was reduced when grown in soil mixed with the leaves of R. pseudo-acacia at various concentrations. Aqueous leaf extracts, when bioassayed, exhibited a significant suppression of radicle growth. Chromatographic separation of an ethanolic extract of R. pseudo-acacia leaves resulted in isolation of three compounds, identified as robinetin (1), myricetin (2), and quercetin (3) by nuclear magnetic resonance and mass spectroscopy. All inhibited root and shoot growth of lettuce. Robinetin, found in a large amount, caused 50% suppression of the root and shoot growth of lettuce at 100 ppm. 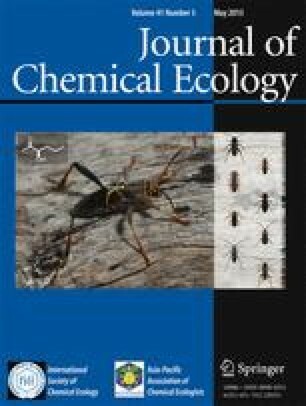 The presence of these bioactive substances in leaf tissue suggests a potential role for flavonoids in R. pseudo-acacia invasion in introduced habitats.